Every so often someone sends me a box full of shaving products to try and I’m always thankful. It allows me to bring to light products that I’ve missed or not available in the U.S.A. 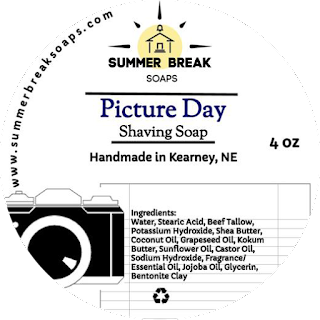 I recently received one from our WTF members and today I’m going to be talking about Summer Break and the tallow based shaving soap called Picture Day. This is a sample size so I can’t talk much about it packaging but the sample itself had a good amount inside and allowed me to really try the product out. I had no other choice but to bowl lather due to the size of the sample. The soap texture was soft and pliable which allowed me to easily place it into the bowl. All I needed was to add a brush full of water and started to lather. The lather whipped up fast and plenty with a thick and creamy consistency. It got right into the beard and held on without disappearing or running it was close to a perfect lather. The scent started to increase slightly as I applied which was a nice surprise. The slickness and glide allowed my razor to glided over my face with ease and this continued unit I was done. My post shave feel was a good one I felt a close shave was had for sure. So, I had a wonderful shave with Summer Break and I think you will too don’t let Picture Day pass you by.